Good afternoon, friends. My name is Emily, and I’ve been attending the Wednesday Meeting for nearly two years. I was really touched to be invited to speak today, so thank you. 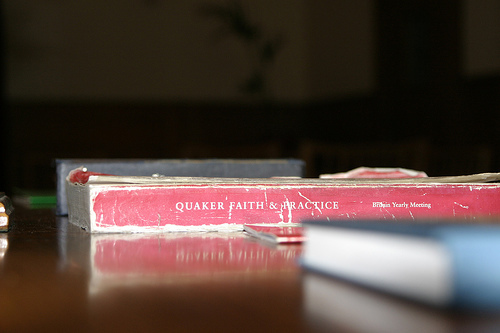 I was originally drawn to Quakers by the testimony of Peace. The Peace movement has been a big part of my education and my work and I kept coming across Quakers associated with events and institutions I was involved in. I’ve been very wary of organised religion, but I was curious about a community that seemed to be so closely in line with my own values. Since I first started attending Meeting nearly two years ago, I’ve often said that the question is not so much why I started coming, but why it took me so long to get around to it. Once I did come to Meeting, I felt at home straight away. For a long time, all I knew for sure was what I was not – I was not, I’m still not a Christian. I first came to Meeting feeling certain that I didn’t believe in very much spiritual at all. Now I actually feel less certain of what I believe, but I’m really glad about that. I would hate to think that I’m missing something. Knowing that I can be a Quaker, and not know what I believe spiritually, while having the principles I believe in so strongly upheld, is what made me feel so certain so quickly that I was in the right place. The space that Meeting and the community around it has given me to ask those questions is the main reason why I encourage other people to consider attending. I love the silence in Meeting. I’m a very verbal person, anyone who’s been around me for tea after Meeting knows that. But I loved the silence from Day 1. What I struggle most with in the Christian church are the words. The silence gives me the freedom to worship in my own way. It reminds me that I don’t need to come up with the words for it, ever. Some of the words that have had a big impact on me since first coming to Meeting, though, are the ones that describe the idea of holding people in the light. It’s become incredibly important to me. That image has helped me have a real sense of supporting people rather than just making a mental note of their situation with some sympathetic noises. The framing of principles as testimonies is also very important to me. It’s helped me look at new ways of living my commitments, especially my commitment to peace. I still struggle with the idea of simplicity, and I still feel like I have a lot to learn, but I’m relishing the prospect. What I know for sure – I know that when I worship, I want to give thanks and celebration for the wonders of nature and human achievement. I know that I look for guidance in being a positive force in the lives of my loved ones and in the world. And I know that being a Quaker helps me to do those things. This talk was delivered at Westminster Friends Meeting for Worship for Business on 10/04/2011.